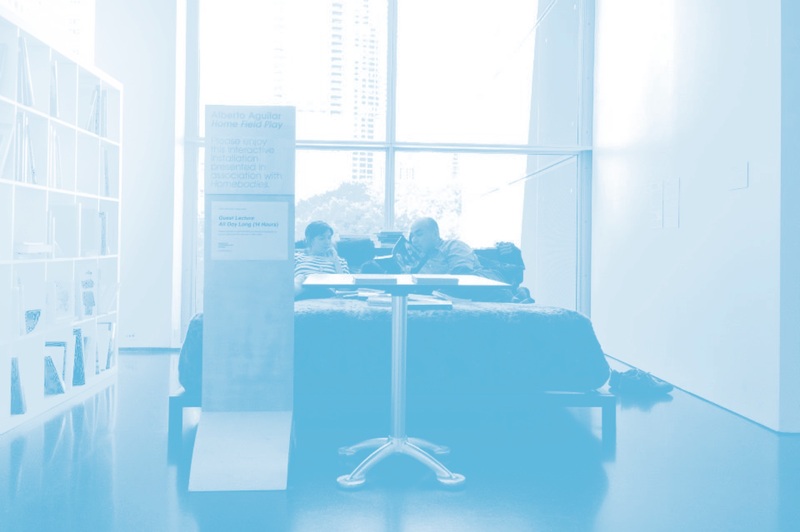 In the fall of 2013 I was invited by the artist Alberto Aguilar to activate a temporary participatory sculpture that he made as part of his inclusion in an exhibition called Homebodies at the Museum of Contemporary Art, Chicago. Homebodies was a show that showcased artists whose work dealt–in some way–with the home, either as material or idea. The sculpture that Aguilar made was a bed covered in a fuzzy animal print fabric and peppered with a generous amount of decorative pillows. The way that I “activated” the bed was by doing a fourteen-hour durational performance on it that essentially entailed me reading aloud continuously while laying down on the bed to whomever wished to lie next to me. The books that I was reading from where denser theoretical books that I had owned for some time but had not had the time to read, due to the fact that this type of text requires–from me–prolonged moments of study, which I hadn’t been able to make time for. Aguilar’s invitation permitted me a space to do this and also provided me with the “crutch” which I’ve used for some time now, when reading difficult text: the permission to read aloud and to another person. This can be an expensive “crutch” to say the least because it requires, not only that I be alert enough to perform the reading aloud, but also that the listener be interested and willing to lend me their time for what essentially boils down to–somewhat of–an esoteric, decontextualized, and boring performance. That sensation is magnified by the durational parameter within which I decided to conduct this task: two full museum days, a Friday and a Saturday from open to close, 10 to 5. In planning for this bed reading piece I leaned on my knowledge of past works where artists or performers presented their bodies and their presence as a type of “thing to look at”. At the same time I was not interested in replicating those “artist is present” gestures–since, as a teacher and a conceptual artist–I’m more interested in how my work “communicates” rather than meditizizes in the same way that Jean Luc Nancy explains it. Briefly, Nancy’s differentiation of communicate and mediate is one that is deeply linked to the experience that a participant has with a given artwork. On the one hand, the mediatizized work is filtered in some way through a media and hence it is a representation of an idea, feeling, or subject. In some ways, as Helguera (2011) has said about some socially engaged art works, it is a symbol of an engagement and not actually engaged in any significant way. Artworks that communicate on the other hand are activated by their force, intensity and affect. They are not the representation of the idea or the feeling, they are—in fact—the feeling and the idea themselves. Now that’s not to confuse where and when artworks are created with and through mediums. One can easily have a communicative experience with an image as one could have a mediated experience with a live human being. I didn’t want to just be a symbol of a man laying on a bed reading aloud; I wanted to be a man laying on a bed reading aloud, even though I knew that the breakdown of the object-connoisseur relationship (especially in a museum) could potentially be more off-putting to the museum visitors than were I—like Marina Abromovic’s or Tilda Swinton’s recent actions—simply something to witness. So, even though I prepared for my performance thinking about Marina Abromovic’s “artist is present”, Vito Acconci’s “Seedbed”, and John Lennon and Yoko Ono’s 1969 “Bed in for peace” (McGrath, 2008), all the while I was mostly motivated by a young girl I heard speak on a conference panel at a curriculum symposium last year, and how what she spoke about made me think about something that happens in my home on a daily bases. John Dewey had an idea of a Utopian school where they get to learn what they want to learn, get to read books they want to read. They get to learn by doing things. So if they want to learn to play violin, they play violin with other people who already know. I like the idea of a Utopian school, but I think they should have added something: that you can learn in bed! You don’t have to get up, get dressed, have breakfast and leave. You can do math, read a book, and write speeches in bed. The bed is more comfortable than a hard wood chair with a desk. Education can be comfortable! And also the love part is that you get to talk to your mom in comfortableness and you get to cuddle with your dad or your mom while you are working. Hearing Grey’s articulation about the bed’s rich pedagogical potential, stirred me. Because my wife and I’s children are also homeschooled, Grey’s words filled me with a sensation of nostalgia, discovery, and excited validation about the worth of something that takes little, if any, effort: the desire to be in bed. The bed’s materiality as a school—through Grey’s words and my sensation—became readily available for manipulation and I was eager to test out its pliability. Since—in my research, teaching, and artwork—I’ve become increasingly challenged by Lucy Lippard and John Chandler’s late 1960’s conceptual art query about “still not knowing how much less nothing can be” (1968/1999, p.50) I am consistently drawn to seek the limits of gestures and ideas that appear to be nothing and even more so, to things and ideas that are actually nothing, or at least provoke that feeling in the viewer. For me this is somewhat related to the pop-up classrooms created out of steel and glass by Liam Gillick (Aguirre, 2009, p16), from her own library by Martha Rosler (Linden, 2006, p.278), from packing tape, cardboard, and Xeroxes by Thomas Hirschhorn (Hirschhorn and Bizzarri, 2011), and from a roving transcontinental tour by Pablo Helguera (Purves and Selzer, 2014, p. 165). Except in the end, the bed-school was not so much about discovering how the bed was a school in the museum, but rather how the bed was already a school within the home. This is a place where healing, loving, schedule-making, counseling, reading, writing, watching tv, being on the computer, eating (sometimes), resting, arguing, comparing, philosophizing, praying, and playing all happen. It is also a place where something much less articulateable happens. Something that involves trust, vulnerability, touch, duration, and learning through the skin. It is both a stage and a classroom and although accented—maybe by pillows and blankets—its principle materials and its most important subjectivities, come from the 6 by 7 feet outline of the rectangle and the multiple players who make their home there. At the end of the two days that I spent lecturing (reading and conversing) on that bed at the MCA I felt tired, but only as tired as I usually feel after about fourteen hours of working through my teaching practice. I didn’t feel spent—the way I usually do after a performance where I’m showing something to others, I felt tired the way I do after working on something with others. All the while there was and truly is nothing to be shown, not even during this brief paper. I can talk about this project and even attempt to theorize it—maybe even mediatize it—and it will not really replicate its affect even if you are having very real feelings about it as funny or stupid, interesting or inconsequential. It’s nothing actually. The project really starts from nothing (just a sensation), it aims towards nothing (just creating a moment), and it leaves nothing (just a brief unwatchable video, a set of photos that don’t really say anything, and only a handful of people who actually participated in the whole thing). In this way it is a middle. “something’s doing” as Brian Massumi (2011) would put it. “something’s happening. Try as we might to gain an observer’s remove, that’s where we find ourselves: in the midst of it. There’s happening doing. This is where philosophical thinking must begin, immediately in the middle” (p.1). Aguirre, P. (2009). Elusive social forms. In Szewczyk, M. (Ed.). Meaning Liam Gillick, (pp. 1-28). Helguera, P. (2011). Education for socially engaged art: Materials and techniques handbook. New York: Jorge Pinto Books, Inc.
Hirschhorn, T. and Bizzarri, T. (Eds.). (2011). Thomas Hirschhorn: Establishing a critical corpus. Illich, I. (1978). Toward a history of needs. New York: Pantheon. Linden, L. (Ed.). (2006). The best surprise is no surprise. Zurich: JRP | Ringier. (Eds.). Conceptual art: A critical anthology, (pp. 46-50). Cambridge, MA: MIT Press. Massumi, B. (2011). Semblance and event: Activist philosophy and the occurrent arts. Canada: John Wiley & Sons Canada Ltd.
Purves, T. and Selzer, A. (Eds.). (2014). What we want is free: Critical exchanges in recent art.